Odds are when you wake up in the morning, you grab your phone and start scrolling. In that moment the world is at your fingertips. A world that is at its best in almost every measurable way – healthier, happier, and more educated. But how are you helping to shape this world? Career is a cornerstone of modern life and yet 85 percent of people worldwide feel disengaged at work. However, when you add meaning to this equation, things drastically change. People want to put purpose at the center of their lives, but lack the connections needed to do so. And if we do nothing, this trend will not change as new generations already trust themselves more than traditional institutions to solve the world’s problems. We can no longer solve from the top-down, we have to empower from the bottom-up and unite the world. People will only feel like they trust the world around them when they have a hand in creating it. Particularly today, when the world is so divided. This might seem like a huge obstacle to overcome, but in reality it is an opportunity. A chance to connect the world, inside and out. From customers, to employees, from suppliers to sales partners – nearly every stakeholder that surrounds a company’s ecosystem, expects the company to do better to make the world a better place. Companies that lead with purpose, not only meet these expectations, they go well beyond. Just take a look at IKEA, taking their core business – well-designed, functional furnishings – and using it to build award-winning, solar-powered refugee shelters. Or Unilever, harnessing their brand power to push efforts to clean up “toxic content” in sponsored media. When we as company leaders align our business goals with a global agenda that drives progress, we inspire our employees to do the same. In a lot of ways, technology is the only fast, adaptive, and personalized solution that we have to build a stronger connection between companies and causes. People also expect technology to be part of the solution because it is what they are used to. Two-thirds of the world is online and half of the global adult population owns a smartphone, with numbers climbing each day. Add to this, the rapid rise of cloud-based networks means our communities are being built and lived online. At Patagonia, they are using technology to create a “dating site” for grassroots activism. Patagonia Action Network will match individuals to organizations tackling environmental issues such as land, water, climate, and biodiversity in their communities. We applaud their efforts. 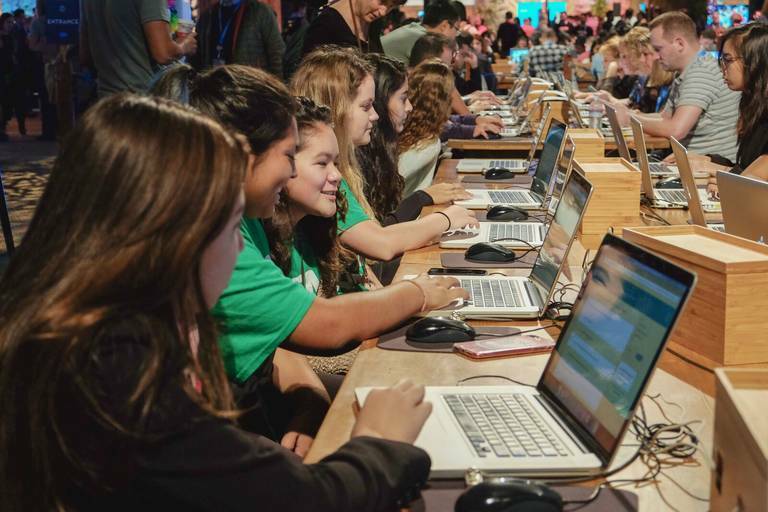 In fact, at Salesforce.org we are leveraging the most innovative technology available to create a one network solution for giving, volunteering, fundraising, and advocating for any cause and at any time. A network where you can find personal opportunities to make a difference, connect to the nonprofits you admire, and have a complete history of your impact, wherever and whenever – a mobile platform for a mobile world. We know the world is at our fingertips. The time is now to do something good with it. To usher in this new era of corporate philanthropy, Salesforce.org is partnering with United Way to combine innovation at scale with global impact at scale, creating the perfect storm: Salesforce.org Philanthropy Cloud was announced this week. We’re connecting extraordinary dots. Now you can align corporate responsibility with employee-driven values with global goals all in one click. And it won’t stop there, employees will create and track their philanthropic footprints – allowing them to fully own the good they do. To learn more, read our blog feature this month on this revolutionary new network for good. Salesforce.org Philanthropy Cloud is expected to be generally available in Summer 2018. United Way is the exclusive re-seller and will provide content and services to help corporate partners connect their employee engagement programs through Salesforce.org Philanthropy Cloud. Salesforce.org Philanthropy Cloud will support North American employee giving to any eligible nonprofit in the United States of America or Canada.